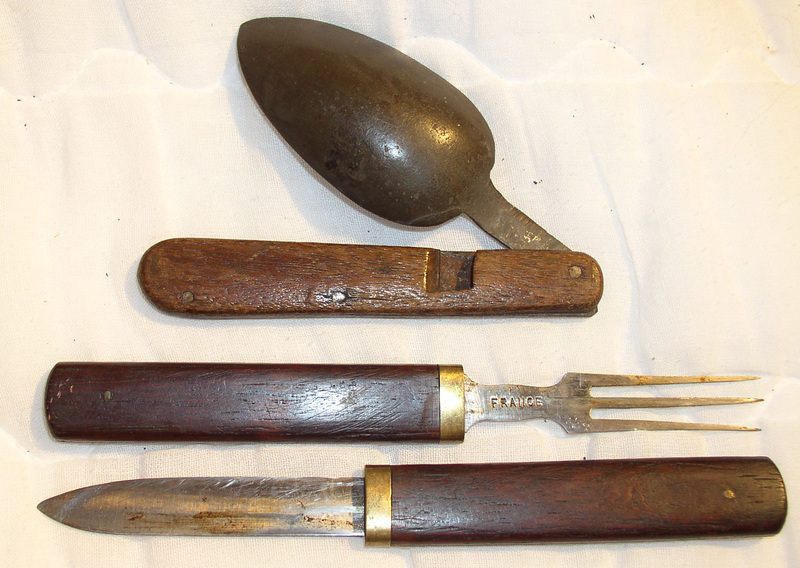 Soldiers travel Knife, fork & spoon. A nice period unmatched set. The knife and fork slide inside each other to protect both pieces. The spoon is made of pewter and folds against the handle. All with wood handles. While not a matched set they are close and were probably used this way. A good representative set and fairly priced. 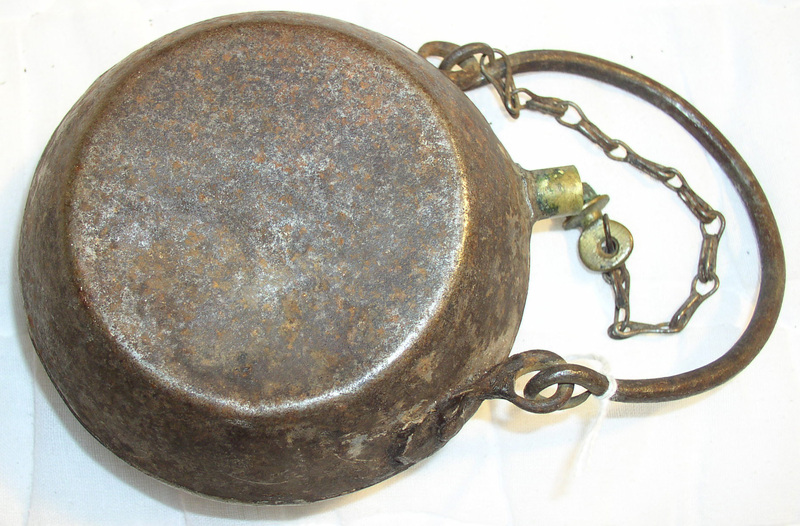 Canteen or grease container, early and possibly confederate. Handmade of iron with a "rat tail" handle. Complete including the handmade chain, brass spout and screw in stopper with visible file marks. A small 4 1/2" x 2 1/2" plus spout and handle. 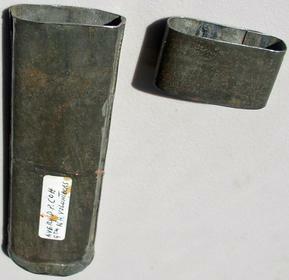 With the small spout it could have been used for bear grease with the iron body helping to heating it up to flow out. With the handle folded down the canteen rests upright at a 45% angle. 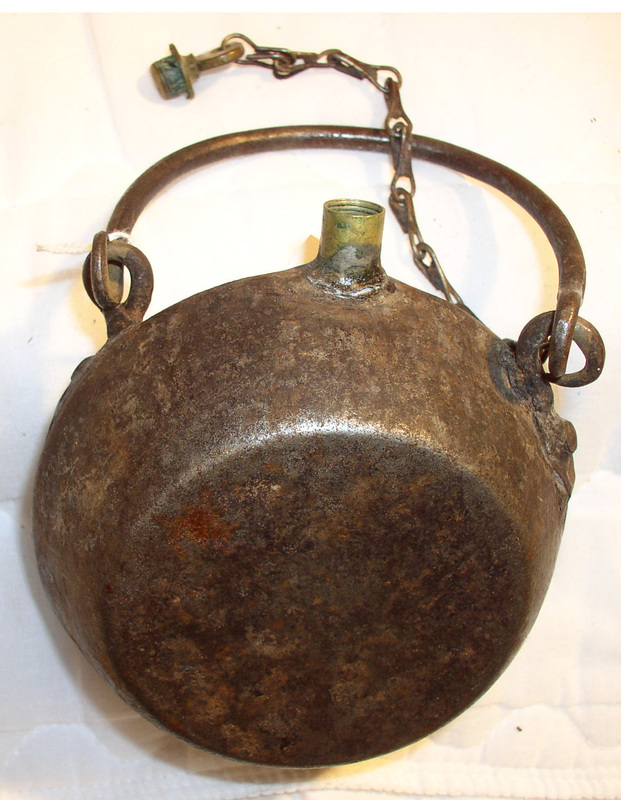 I have seen this style canteen also called a confederate medical canteen due to the handle. Cowans sold a similar one they considered confederate missing the chain they sold it for $375. Slate pencils - Original unused Civil War slate pencils with patriotic paper sleeve. Paper is fragile and may have minor defects. Match safe, ID'd -" D.P.Avery 9th N.H.V." then once from the Army at Antietem on 9/17/62. Candle holder, candle sits in top. It has one spike sticking out the side and another sticking out the bottom. It was meant to be stuck in a log or tent pole when used. An uncommon item that when found is usually a dug relic. This is an original, unused, mint condition piece made of zinc plated iron. Carbine bore brush. Used to clean the bore on early breech loading carbines by dropping the leather thong through the barrel and pulling it out the other end. Often the thong breaks completely off or is less than full length. This brush is Civil War unused surplus and till still has the full length tong attached. Last one available. 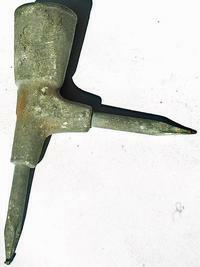 Cavalry picket pin. Original Civil War pin, full length and still has the rotating ring at top. The pin was driven into the ground and the horses lead was tied to the ring that rotated so the horse could walk around the pin. This pin is not a dug relic, it has only minor surface pitting on the top. Tin drinking cup, typical of the type Civil War soldiers purchase from sutlers. Not a dug relic with only light surface rust. Will clean up nicely. displays beautify. Overall length is 3 1/4"
An impressive piece under priced due to condition. with many small dents but still in good condition. Original top and hinge function properly.